Добро Пожаловать в Кемпинг "Черноморский"! Witamy na camping na plaży! Willkommen auf Beach Campingplatz! Welcome! Mongol Rally Pit Stop 24/7! – Лодки на прокат, бунгало и автодома в аренду. We are conveniently located just 0.8km off main Batumi-Tbilisi highway, 15km north of Kobuleti, and 1km south of Ureki. 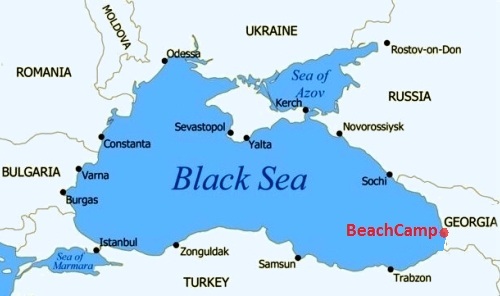 Look for the sign “Beach Camping” on the highway, or use this GPS link location: BlackSeaCamping Ссылка для Навигатора. The campground can accomodate all types of travelers. Whether you are traveling by foot, bicycle, caravan or 4×4 you’ll find this a perfect place to relax, and recharge for a new adventure. Welcome to Ureki!